Earlier today (Sunday, September 21st) a SpaceX cargo ship headed out to the International Space Station (ISS). On the craft was the very first 3-D printer for astronauts in orbit on the ISS. Currently, it is expected that Dragon will reach the space station on Tuesday, marking the fifth station shipment for the California-based SpaceX. Ultimately, SpaceX is one of two new commercial winners in NASA’s most recent attempts to send Americans (and American materials) to space from U.S. soil. 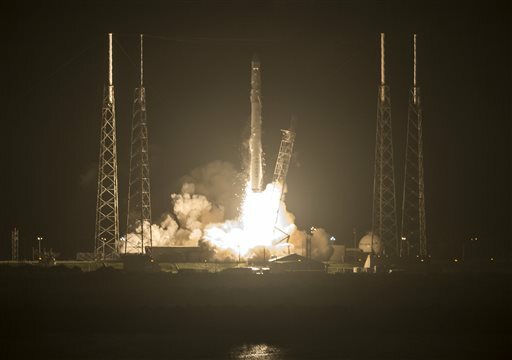 At the time of the launch, the ISS was headed over the South Pacific, and the SpaceX Falcon 9 thundered into Florida’s darkened, pre-dawn sky. The 3-D printer that is being carried on the SpaceX craft was developed by Made in Space, which is also a company that us based our of California. of course, this is not your average, run-of-the-mill 3-D printer. It is built to be stronger than its Earth-based counterparts, as this model needs to be able to withstand the stresses of launch and also meet NASA’s strict safety standards. NASA has reported that they hope that individuals on the ISS will, one day, be able to produce any spare parts that are needed right from the ISS. This could significantly reduce the amount of trips that need to be made to the ISS, and it could make planning a bit easier (as well as make the astronauts a little safer). However, for now, the printer is a technology demonstrator, with a bigger and better model set to follow next year. Of course, that is not all that is being transported, all in all, the unmanned Dragon capsule is carrying some 5,000 pounds (2,270 kilograms) of supplies to the astronauts. In addition to the printer, SpaceX is also carrying a $30 million device that will be used in order to measure ocean winds. And the astronauts are also going to be getting some new friends, as there are 20 mice and 30 fruit flies that will be used for biological research. Perhaps most importantly, the craft is transporting some spacesuit batteries, along with the usual supply of food, clothes, and necessary electronic gear. The batteries are of particular importance as U.S. spacewalks were put on hold following last year’s close call with an astronaut’s flooded helmet. This problem was solved, but then the battery fuses were called into question. NASA hopes to resume spacewalks next month. NASA is paying SpaceX and Virginia-based Orbital Sciences Corp. to make regular station deliveries, marking the start of the United States return to manned missions and delivery to the ISS. The SpaceX service began two years ago, and this week SpaceX won an even bigger and more prestigious contract—to transport U.S. astronauts to the ISS, along with Boeing. Dragon rides could begin as early as 2016 or 2017. This is a notable announcement, as NASA’s ability to launch its own crews ended with the shuttle program in 2011. Russia has been providing rides on its Soyuz spacecraft for a hefty price. Another American astronaut is scheduled to blast off from Kazakhstan aboard a Russian Soyuz craft later this week, along with two Russians, one of them a woman, a rarity for Russia. READ NEXT: What Would It Be Like To Live On The ISS?